When there is a risk of drivers or those operating other vehicles or machinery on site encountering pedestrians, Pedestrian Warning Signs such as caution pedestrian sign or caution pedestrian crossing signs are an effective means of keeping both parties safe. Pedestrian warning signs are crucial in protecting the safety of those visiting and working on site and should be displayed prominently to ensure their presence is effective. Signage should be affixed and displayed effectively where it can be seen. Affixing Access Awareness Pedestrian Signs to illustrate appropriate routes for pedestrians is another useful option to keep pedestrians and vehicles safely segregated. If members of the public and other pedestrians are likely to set foot on your premises, it is important to protect them from the risk of injury from vehicles. This can be achieved by mounting Pedestrian Hazard Warning Signs close to where the danger is most likely to warn both them and drivers of any potential hazard, for example, signs that inform pedestrians to look both ways before crossing. Warn those travelling by foot of the presence of vehicles and provide them with clear signage to the safest route. Pedestrian Signs and signposted pedestrian routes aren’t exclusively useful to your visitors – they can also help you by reducing accidents and providing a visitor-friendly experience. Health and Safety legislation advises that workplaces and premises owners should not only display relevant, compliant signage to safeguard pedestrians but that they should also provide them with designated pedestrian walkways. These areas should be located at a safe distance from any hazardous situations (such as machinery, moving parts or forklift trucks) and remain well-lit and free from obstructions at all times. Particularly hazardous areas should be completely partitioned off and visibly signposted with appropriate safety warnings. Safety signs are not the only way of keeping pedestrians safe. The wearing of High Visibility Clothing means that employees, drivers or warehouse operatives stand out and remain visible at all times, acting as a further warning to those navigating routes around your premises. Where applicable, pedestrian walkways should have permanent barriers to further protect pedestrians from vehicles and/or machinery. All employees and/or contractors should abide by your company’s health and safety policies at all times and keep a respectful distance from pedestrians. Forklift trucks should be driven slowly, paying special attention to blind spots, slopes and tight corners. Drivers should sound the forklift horn at intersections or during times where they are uncertain if a pedestrian has seen them approaching. It is also best practice to avoid driving forklift trucks or operating dangerous machinery near areas or in time slots where pedestrian traffic is likely to be higher than usual; for example, near entrances or exits to the building, clock-in stations, staff areas or during lunchtime. 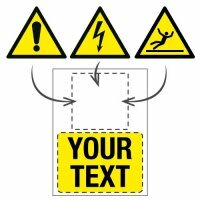 Our wide range of Pedestrian Warning Signs will help make your premises a safer place for all. Signs are available in a variety of sizes and materials and with different messages to suit your needs. What’s more, they are suitable for use indoors or outdoors – see our handy guide for more information on the materials available and their suitability for indoor or outdoor use. Here at Seton we also provide other warning signs to protect workers and visitors from other potential hazards. 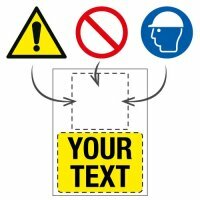 If you require a pedestrian hazard warning sign that features a fully compliant ISO symbol but with wording that is unique to your business, then we can create a custom sign to your specifications.